Holliday Park works with a variety of organizations to host workshops, seminars and lectures on natural and cultural history designed specifically for adults. Check out the event calendar for a full listing of upcoming programs. 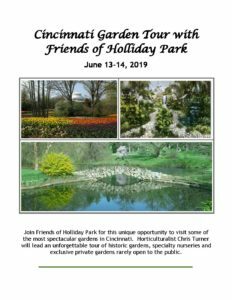 Each year Friends of Holliday Park is pleased to sponsor a variety of special events that also serve as fundraisers for Holliday Park. Don’t miss your chance to visit these incredible destinations and support one of the most unique natural places right here in Indianapolis! Although many people have been to central Panama, the western part of the country is much less visited. 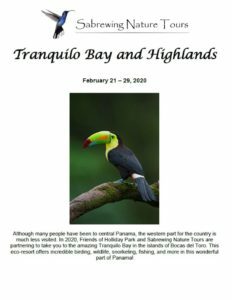 Friends of Holliday Park is partnering with Sabrewing Nature Tours to take you to the amazing Tranquilo Bay in the islands of Bocas del Toro. This eco-resort offers incredible birding, wildlife, snorkeling, fishing, and more in this wonderful part of Panama! Registration will be available beginning June 1st.